So here you go, as promised, my first vegan recipe and it’s an amazing one, if I can say so myself. I recently bought the Vegan comfort classics cookbook by Lauren Toyota (@Hotforfood) and it is full of really easy to make comfort recipes that are perfect for this cold weather. To start off with I want to share the best Vegan Mac & Cheese recipe that I have found in the book and slightly adapted it for my taste. 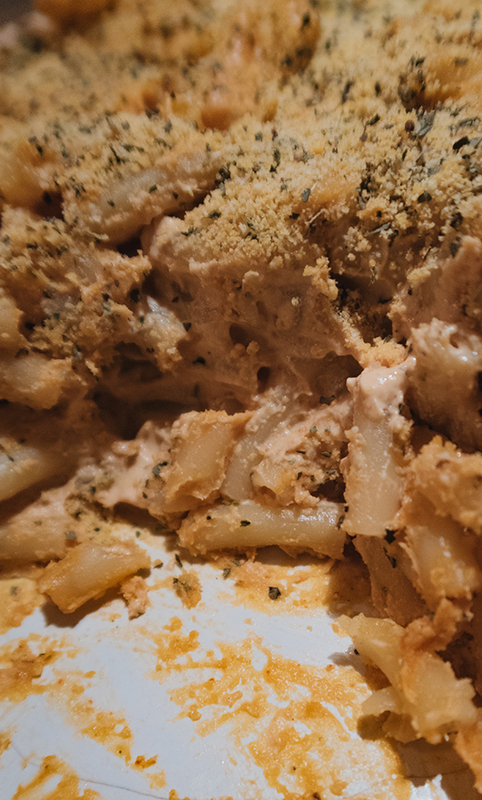 This Vegan Mac and Cheese has a slight kick from the chilli and is probably even more flavoursome than the traditional non-vegan one. It’s perfect for a chilled-out meal when the temperatures outside and keeping you wrapped up warm inside. It may seem like a long list of ingredients but believe me this is so simple to make. Firstly, get the cashews in the hot water if you haven’t done so already as these will need 20 mins. Use this time to find and get all the ingredients out. Cook the pasta in a pot of salted water until al dente and once done, drain but don’t rinse. Combine all the ingredients for the topping in a small bowl and give them a good stir and set to the side for later. Pre-heat your oven to 180C whilst you prep everything else. Once the cashews have finished resting in the hot water, drain and rinse the cashews and then combine with all the other ingredients for the sauce straight into a high-powered blender (I use my Nutri-bullet) and give them a good blend until you have a smooth creamy liquid. Put the pasta into a good size baking dish (around 23cm) and spread out evenly. Then slowly pour the mac & cheese sauce over the pasta and combine thoroughly (make sure you really mix it, look in the corners and really turn the pasta over). Once thoroughly combined, pat down the pasta to even it out. Then slowly sprinkle the topping mix you made earlier evenly across the top of the pasta to cover it. Cover you Vegan Mac & Cheese with baking foil and place in the over for 20 minutes to slowly cook. After 20 minutes, remove the foil and cook for a further 10 minutes… et voila you are done. Make a picture of your Mac and Cheese, put it in your Instagram Stories and tag me. I’d love to see who of you tried this recipe.